Shuhua Fan, Ph.D., professor of history, and Ann Pang-White, Ph.D., professor of philosophy and director of Asian Studies, spoke at the first of a three-part spring lecture series exploring Women in Asia, presented by Asian Studies Program at the University. 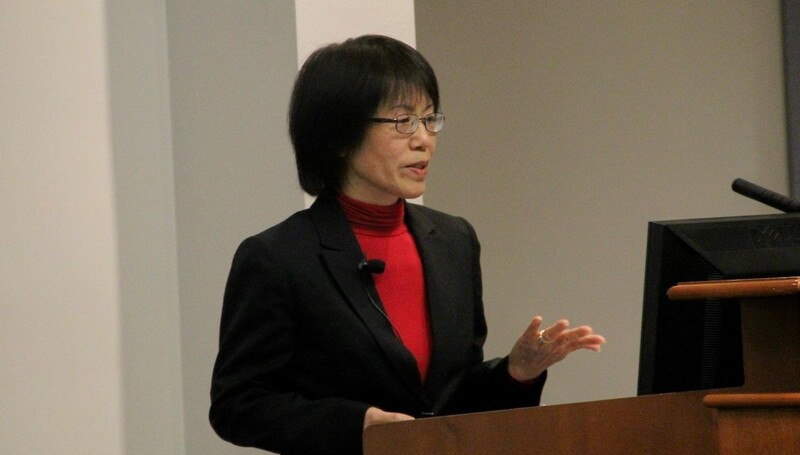 The University of Scranton Asian Studies Program began a three-part spring lecture series exploring Women in Asia with presentations by Shuhua Fan, Ph.D., professor of history, and Ann Pang-White, Ph.D., professor of philosophy and director of Asian Studies. The professors discussed the historical and philosophical portrayal of women in mainland China and Taiwan, with a focus on inequality and obstacles faced by Chinese women and the possible means of redemption offered through Buddhism, Confucianism and Daoism. Dr. Fan also discussed the role of a concubine, a woman who lives with a man in a household but has a lower societal status than his wife or wives. A concubine was seen to fulfill the man’s sexual desires and bear children. “Concubines mainly functioned as a symbol of power and wealth, because families needed to have sons,” Dr. Fan said, who noted that having a son was seen as much more valuable than having a daughter at the time. The people of power ranged from military leaders to political leaders in China. It wasn’t until 1971 that a ban on concubines began with the Marriage Reform Ordinance in Hong Kong. Since the 1980s, however, Dr. Fan said there has been resurgence of concubine culture in China with the trend of wealthy business men having mistresses. “The central government, the provisional government and private organizations have launched campaigns on anti-mistress and anti-corruption,” Dr. Fan said. Dr. Pang-White began her lecture with a poem on Buddhism and how gender is not a factor when someone ascends to enlightenment. Dr. Pang-White said that women were eventually allowed to form their own nunnery, not to be governed by men. There were still rules, the “8 Heavy Rules,” that nuns have to follow. This discrimination started to dissipate with a folklore tale from the book “Lotus Sutra.” In the book, the Dragon King’s Daughter sought to achieve enlightenment from the Buddha. She was rejected at first for not being a man then became enlightened after offering a pearl to the Buddha. In 1949 when the communist party took power in China, Buddhist monks fled to Taiwan and were in need of students, so they took female students. “They integrated women’s status as legitimate students in Buddhism,” said Dr. Pang-White. Women in Buddhism continued to grow until the point where women were allowed to own their own monasteries and work with the male monks in Taiwan.